The Wooster Group ensemble in A Pink Chair. Photo by Maria Baranova. BOTTOM LINE: The Wooster Group pays tribute to artist Tadeusz Kantor in this meditative production haunted by the video ghosts of past and present. A Pink Chair (In Place of a Fake Antique), the new piece by renowned Wooster Group, feels like a séance to summon the spirit of Polish artist Tadeusz Kantor. Multi-hyphenate Kantor started directing avant-garde theater in Nazi-occupied Krakow in 1942; he died in 1990, leaving behind a few films of his performances, manifestos and a daughter, Dorota Krakowska. Elizabeth LeCompte, longtime leader of the Wooster Group, takes the archival material and the testimonials of Krakowska as a starting point in creating a ritual to bring Kantor back to life. Who but The Woosters, with over 40 years of experience in theatrical alchemy, is up to the task! 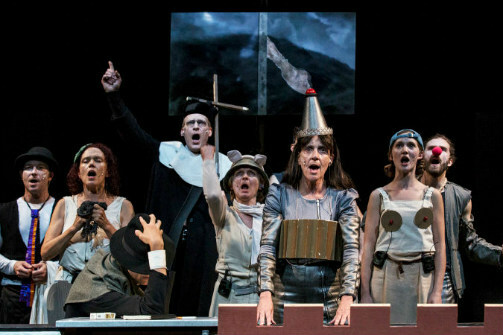 The result is a 70-minute multi-media spectacle, which includes fragments of video interviews with Dorota Krakowska and the re-enactment of I Shall Never Return, Kantor's second to last piece, by the members of The Wooster Group. On a TV screen in the middle of the stage, we see the 1989 performance featuring Tadeusz Kantor and his actors. On stage we see members of The Wooster Group in costumes (by Enver Chakartash) resembling the original production, recreating the moves of the actors on video. As the camera changes angles, the actors change their positions and reassemble the furniture on wheels in sharp swift moves. The dialogue between the recording and the live performance is masterfully timed. Zbigniew "Z" Bzymek, in a slick black suit and a hat, portrays the Polish director. But, unlike Kantor, who is an active participant of his performances, Bzymek is bound to a chair, a cigarette glued to his fingers, with a fixed gaze as if from a photograph. The actor resembles one of the mannequins that Kantor frequently used in his performances. Bzymek is a stand-in, a sign in place of the main character in this elaborately designed memory machine. It is not the single actor’s body, but A Pink Chair in its entirety that portrays Kantor. This seems appropriate since I Shall Never Return is an autobiographical piece, where different characters embody the ghosts of Kantor’s life. The screen in the middle of the stage eventually disappears, but we can still see that the actors take their cues from the smaller monitors scattered around the theatre. Their eyes are always on the video ghosts of Kantor’s ensemble, devoted solemnly to the connection through time, as if channeling them. The cast’s presence, divided between the screen and the stage, creates an uncanny and exciting, yet alienating sensation. The experience is like watching a religious ritual performed for the gods, not the human beings. A Pink Chair culminates in a rousing hymn, "Bound for the Promised Land." And despite the clown accessories that the actors have donned by the end of the show, the moment is full of pathos and simply divine. A Pink Chair was created by the Wooster Group. Directed by Elizabeth LeCompte. Dramaturgy by Dorota Krakowska. Lighting Design by Jennifer Tipton. Sound Design and Original Music by Eric Sluyter and Omar Zubair. Video and Projections by Robert Wuss. Costumes by Enver Chakartash. Stage Management by Erin Mullin. The cast is Zbigniew Bzymek, Enver Chakartash, Jim Fletcher, Ari Fliakos, Gareth Hobbs, Dorota Krakowska (on video), Andrew Maillet, Erin Mulin, Suzzy Roche, Scott Shepherd, Danusia Trevino and Kate Valk.